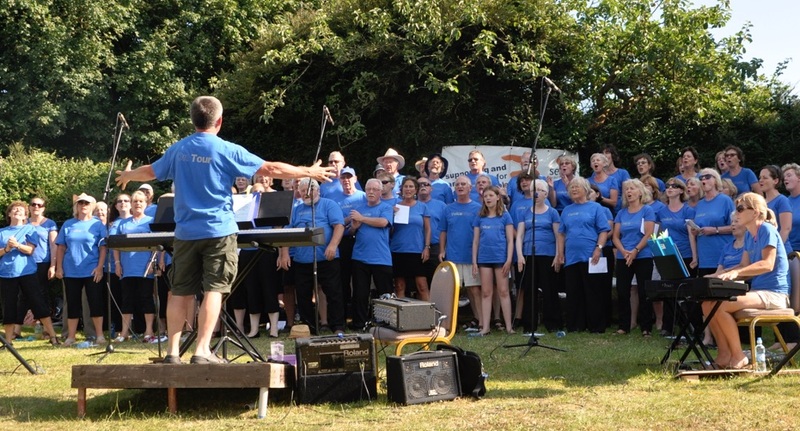 Voiceworx is a community choir based in Kentisbeare, Devon. We sing all kinds of music from rock, to folk, to classical and more. Anyone can join as there is no audition and no upper or lower age limit. Most weeks we are between 60 to 80 singers, so if you love singing but feel a little shy then please come along. It's so easy to simply blend in! We meet every Monday evening at 7pm during the school term time. Click on NEWS AND EVENTS to view our rehearsal and event dates. We meet at Kentisbeare Village Hall EX15 2BG. The entrance is not on the High St but at the back of St Mary’s church where there is ample parking. Click here for a map. Voiceworx holds concerts, at least two or three times a year. We also get invited to sing at events, such as weddings, Exeter Chiefs rugby, country fairs, charity fund raising events etc. All these performances are optional so there is no pressure to perform. This year we are also hosting a singing festival of choir workshops in Uffculme, Devon, called Choirworx, for anyone who wants to learn some harmony singing, in a mass choir, from gospel and jazz to rock and more! Come and sing with us any time or come and support our events. At Uffculme Show 29th April. See exevalleyrotary.org.uk for full details and how to get there. Want VoiceWorx to sing at your next function? Why not hire VoiceWorx to entertain at your next event? We can perform at corporate functions, charity events, community Entertainment events, birthday parties, christmas parties, awards nights, weddings, engagements, anniversaries, engagements, and even funerals and memorial services.